Dolby has a very cool stand in the middle of the audio hall here in Vegas, and the chaps there have been showing us some very cool technology behind closed doors. Wouldn't you like a quick rundown of everything we've seen? Of course, Dolby is right behind Intel's new Viiv platform, and on its stand we saw a number of machines badged up with both Viiv and Dolby stickers. Dolby's sticker programme certifies PCs with different levels of capability - for example, a Dolby Master Studio machine can do all kinds of upmixing and encoding, as well as supporting 7.1 digital audio and an awesome sound and signal quality. This hooks in with Viiv very nicely, since that specification requires high definition audio. A box that is stickered with both Viiv and Dolby Master Studio is going to give consmers a stunning audio experience, and that is a message that Dolby is keen to get out there. 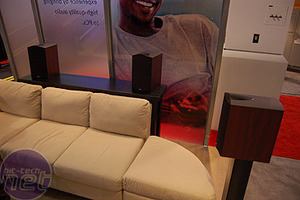 We sat and had a listen to just such a system and we were thoroughly impressed with the sound quality. 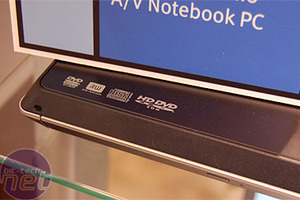 It's everything a home theatre PC should be in terms of sound, supporting the top-end DVD and HD-DVD audio standards. Master Studio systems are able to upmix stereo content to 7.1 audio using Pro Logic IIx. Whilst some audio purists may gag at the idea of fiddling with stereo content, we thought it sounded absolutely fantastic - the sense of immersion in the audio was incredible, and the way the codec separated the instruments out between the channels was really very cool, and far better from previous upmixing solutions we've listened to. This is a new audio standard designed for next-generation Blu-Ray and HD-DVD players and content. It's a high-definition, lossless audio format that delivers audio at 24-bit and 96kHz at a stupendous 18mbit bit rate. 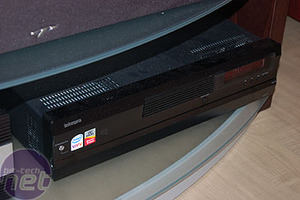 It can support more than eight channels of audio, but since the next-gen players don't support more than eight channels, it's unlikely you'll see much use made of that feature. We listened to some content delivered in TrueHD - some classical music, and some short clips from Lost in Translation. I personally struggled to hear the difference in the classical short, but I found the difference in the Sofia Coppola film tangible. The sound design was precise and intricate enough to really appreciate the extra definition being given to the various elements in the scene, and it really added a new dimension to the film. 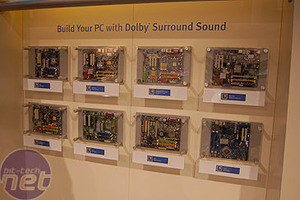 Along with TrueHD, Dolby screened a concept piece for 14 channel audio, with 13 surround sound speakers and a subwoofer. We watched a race sequence from 2 Fast 2 Furious which Dolby had upmixed for the occasion. It sounded awesome, and sound placement was inventive. The guys at Dolby don't really have a plan to roll this out in the near future, esxpecially since next-gen optical formats don't support it. However, it was a great concept to experience - although we have to suspect that there is a minimal market for this. After all, how many people do you know that even have 5.1 setups, let alone 13.1? We also caught sight of a couple of other displays on the stand. 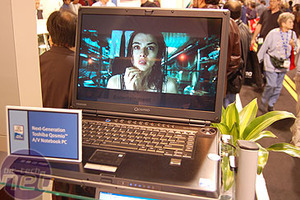 One was a new Toshiba Qosimo laptop. This 17&quot; notebook sports a HD-DVD drive and Dolby certification, as well as GeForce 7-series graphics with H.264 hardware acceleration. We also saw a display of motherboards that are now shipping with Dolby-certified on-board audio, such as the Abit AN8, a board we showed you a while back. Got some thoughts on Dolby's technology? Drop by our forums and let us know what you think. 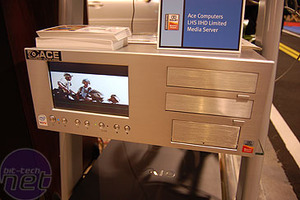 A system from ACE which includes a video screen, and the motherboard display of Dolby integrated audio.